Renner Field's barrel hangar was a 1934 Works Progress Administration project and it was almost demolished. In 2006, then Goodland City Manager Wayne Hill estimated restoration costs at $150,000 to $200,000 and said it "wasn't historic enough" to save. Watson Hevner's daughters stepped in. He managed the airport from 1949-66 and the Hevner family lived in an addition to the hangar, which was later torn down. The women, Judi (Hevner) Vignery and Susan (Hevner) Elliott, grew up there. They campaigned to keep the hangar from destruction and were successful. The hangar did have historic significance, not only as a WPA project but also as a World War II glider training field. The cost for the entire airfield was $42,783 with the hangar specified to be 80 feet wide and 100 feet long with an 18 foot ceiling. 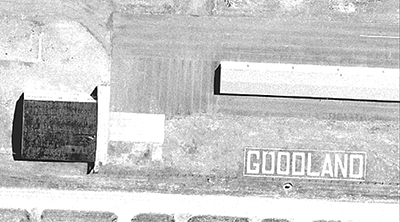 A large concrete "GOODLAND" sign was laid out in the concrete south of the hangar. Its letters are 36 feet high and the entire sign is 24 feet long. Airport opened November 22, 1934 and was dedicated October 10, 1935. William A. Ong ran a glider pilot school for the U.S. Army Air Forces Training Command's 22nd Glider Training Detachment from June 8 to August 29, 1942, graduating 295 students. Training then halted because of equipment shortages. Students practiced dead-stick (no engine) landings in Piper Cubs. "We flew a landing pattern and on the downwind leg, the instructor would pull the throttle," Second Lieutenant Sherfey T. Randolph recalled. "It was up to the student to fly the rest of the pattern and get the plane down on the field." Second Lieutenant Frank Zinser recalled, "Those night dead-stick landings were hellish." The airfield was used as an auxiliary airfield until war's end. Airfield returned to civilian control in September 1945. During wartime, the airfield had four compacted soil runways, one of which is now paved and used as the main runway. The others are still visible in aerial photography. In June 2007, John Topliff agreed to lease and restore the hangar to use. Rehabilitation began a year later. Topliff eventually bought the building and the old hangar still stands. While at the airport, stop at the terminal. See the model of "America's First Patented Helicopter", eat at Butterfly Cafe and learn about Dr. M.J. Renner, for whom the airport is named. Goodland has two more New Deal public works buildings, Goodland High School and Goodland Post Office.